Mix it right into your paint or stain to repel carpenter bees, ants, and more. Build, heal end-cuts, stain and preserve your deck all on the same day. Mix it right into your paint or stain to control mold, mildew and algae growth. Mix it right into your paint or stain to pepel carpenter bees, ants, and more. How can I protect and preserve my log home and deck? 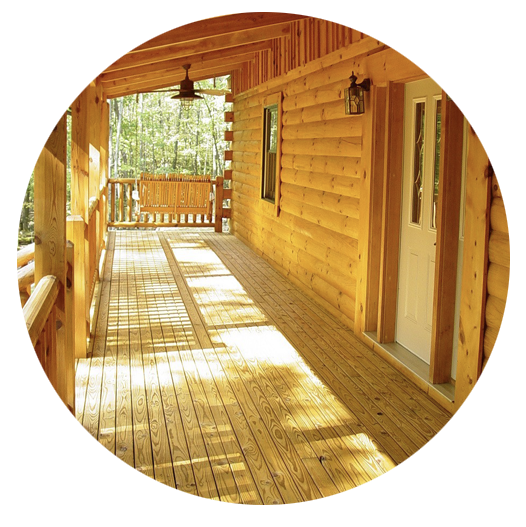 Outlast specializes in wood treatment products specifically designed to protect and preserve your log home, deck, fencing and exterior wood siding. Nothing penetrates wood and preserves like Q8. 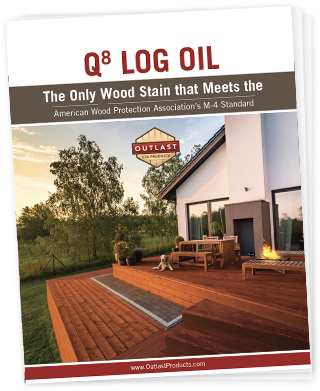 As a matter of fact, our Q8 Log Oil is recommended by name in the Wolmanized Wood Warranty. Oxine copper is recommended by the American Wood Protection Association in the M-4 Standard. The International Code Council’s committees recognize AWPA as the authority on treated wood and have now referenced AWPA Standards for end-cut treatment in the International Building Code and the International Residential Code in applications where wood preservative treated wood is required. Learn how to comply today. For years, log home builders have been selling our EPA registered Q8 Log Oil to their homeowners because they know it works! By protecting their customer’s investment they ensure a happy homeowner long into the future! Log home builders also add our NBS 30 botanical insect repellent to stop carpenter bees in their tracks. "From obtaining product samples and valuable application information, to speaking with [Outlast] R&D scientists, you and your company have exceeded every expectation my wife and I have for a wood stain provider." Stain and protect your deck the same day you build it. Outlast specializes in wood treatment products for log homes, exterior wood siding, fences, pressure treated lumber and decking. We offer an EPA-registered wood preservative and the only botanical insect repellent additive for exterior coatings. Our product line includes Exterior Finishes and Cleaners, Paint and Coatings Additives, Interior Finishes, and Cleaners.